Research is one of PWSA (USA)’s Five Pillars of Support and also a vital component to the treatment of Prader-Willi syndrome. 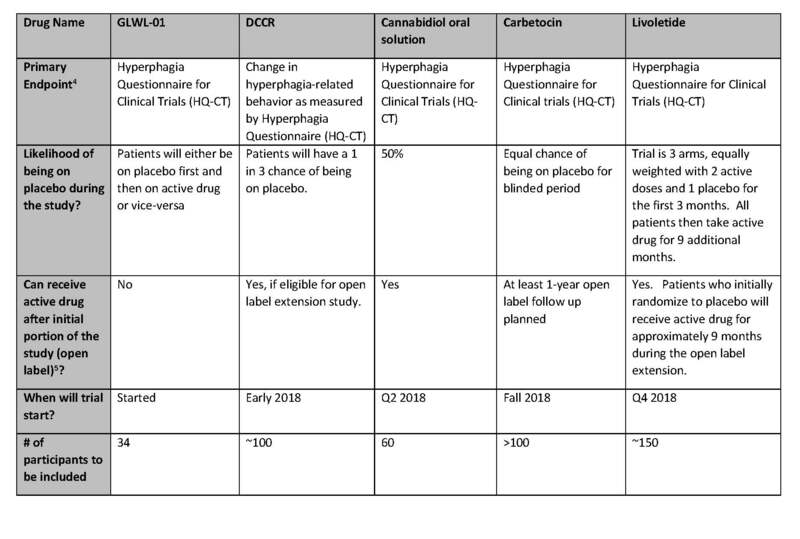 Thanks to the work of a dedicated PWSA (USA) board member, we can share with you a compiled list of upcoming PWS drug trials. It is an exciting time for drug development for Prader-Willi syndrome! Trials for several drugs that may treat behaviors related to hyperphagia (excessive hunger) have begun or will begin soon. We urge all families/caregivers to consider enrolling in a clinical trial. It is important for our community that enrollment in these studies is completed as soon as possible. However, clinical trials involve risks and labor—please consult with your physicians and refer to the following resources for more background on participating in clinical trials. 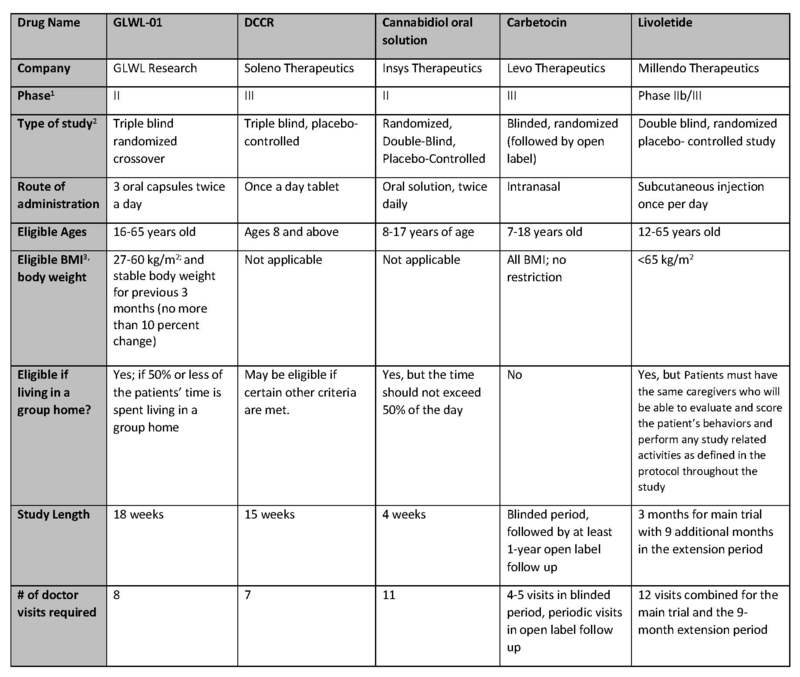 For those who are potentially interested in participating in a clinical trial, please see the table below for a comparison of the trials. This information was collected from the sponsoring companies to provide a complete and comparable listing of the studies. Below the table is more information about each study and links for more information (especially information on sites where these studies will be taking place). Drugs in development go through three stages called Phase 1, Phase 2 and Phase 3. Phase 1 is the first phase of in human tests and is usually done in healthy volunteers. Phase II usually include treatment in patients to judge efficacy and is often done to determine dosing. Phase 3 is the stage needing the most patients and lasts the longest. It is the typically done with randomized, placebo-controlled trials to finalize the testing before FDA review. Placebo—a “fake” drug that looks like the active drug but has no medicine. Placebo is given to compare results for an active drug to a fake drug to see if the active drug is actually making a difference. Randomized— this refers to a trial that randomly chooses which patients are on active drug and which are on placebo. Triple blind or blinded—to avoid bias, trials often prevent patients, doctors and companies from knowing if they have received active drug or placebo. This is referred to as blinding or a blinded trial. With a triple blind trial, neither the patient, the doctor or the company know who is getting active drug and who is getting placebo. Crossover design—each patient receives both placebo and active drug over equal time periods but no one knows if the placebo is first followed by the active or vice versa. BMI – “Body Mass Index” is a measure of obesity used by clinicians and is calculated by measuring weight and height. Individuals with BMIs over 25 are considered “Overweight” and individuals with BMIs over 30 are considered obese. Primary Endpoint: Clinical trials typically have one measurement that is the primary determinant of the success of the trial. For example, in most PWS hyperphagia trials, companies will use a hyperphagia questionnaire to measure changes in levels of hyperphagia as the primary endpoint. Clinical trials usually also have secondary endpoints that are measure in addition to the primary endpoint. Open label – often clinical trials have a blinded phase followed by an “open label” extension where all patients receive active drug and continue to be monitored for longer term safety and tolerability. The primary objective of this clinical trial is to evaluate the efficacy of GLWL-01 given in capsules at doses of 450 mg twice a day, compared to placebo, in reducing hyperphagia-related behaviors in male and female patients with PWS. This medication has been shown to be safe and well tolerated at doses up to 600 mg given twice a day for 28 days in patients with Type 2 diabetes. Side effects were mild and moderate, and generally related to the gastrointestinal tract. Insys Development Company, Inc. is conducting a clinical trial to determine if the use of cannabidiol (CDB) is safe and effective in the treatment of Prader-Willi Syndrome. To determine if CBD is effective in Prader-Willi, the trial will be evaluating in children between 8 and 17 years old whether the use of CBD provided as an oral solution can help control continual feeling of hunger regardless of food intake and the effect of CBD on compulsive behaviors. After completion of the study, patients will be offered the opportunity to enroll in an open-label, long-term safety study. The For more information, a description of this study including the location of the sites that are enrolling patients is available at https://clinicaltrials.gov/ct2/show/NCT0284493 . Carbetocin is an investigational drug that was created to have effects in the body like oxytocin. Carbetocin is not approved in the United States, but is approved in some other countries for treatment of women with excessive bleeding after giving birth via caesarean section. Carbetocin has been studied by Ferring Pharmascience Center for the treatment of PWS in a Phase 2 study at Vanderbilt University, University of Florida and Winthrop University. Further development, including the Phase 3 study, will be pursued by Levo Therapeutics. Plans for the Phase 3 study are subject to change. https://.levotx.com. More information on Millendo and livoletide can be obtained at www.millendo.com. Trial details will be available later in 2018.